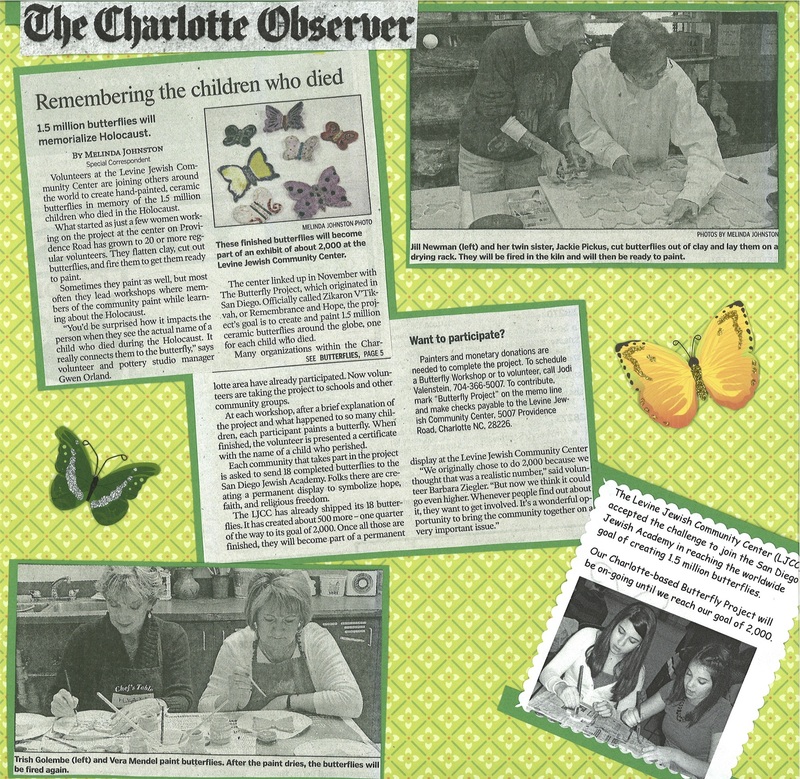 The Butterfly Project is a call to action through education, the arts and memorial making. 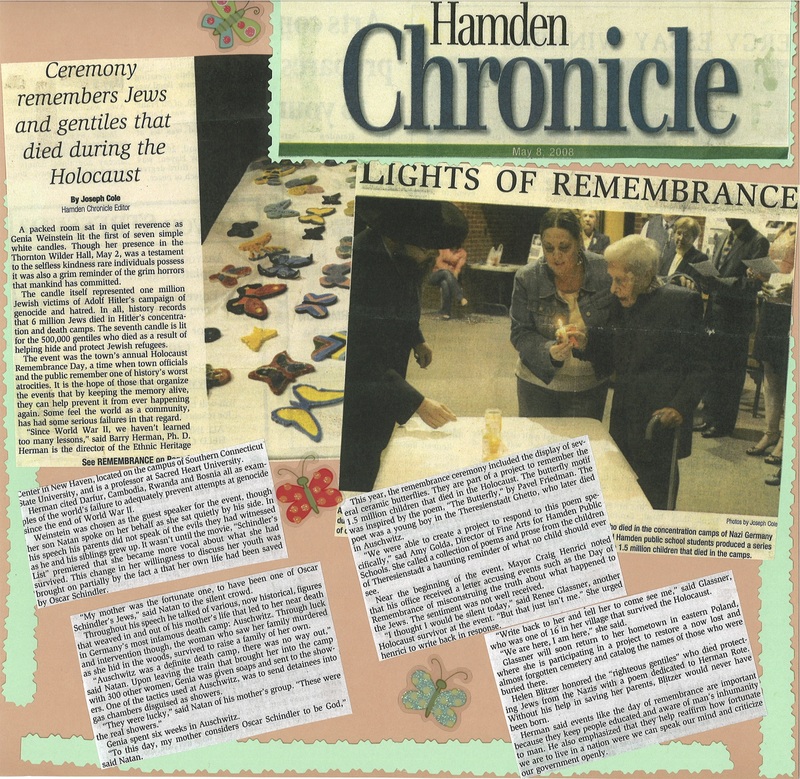 It uses the lessons of the Holocaust to educate about the dangers of hatred and bigotry and cultivates empathy and social responsibility. 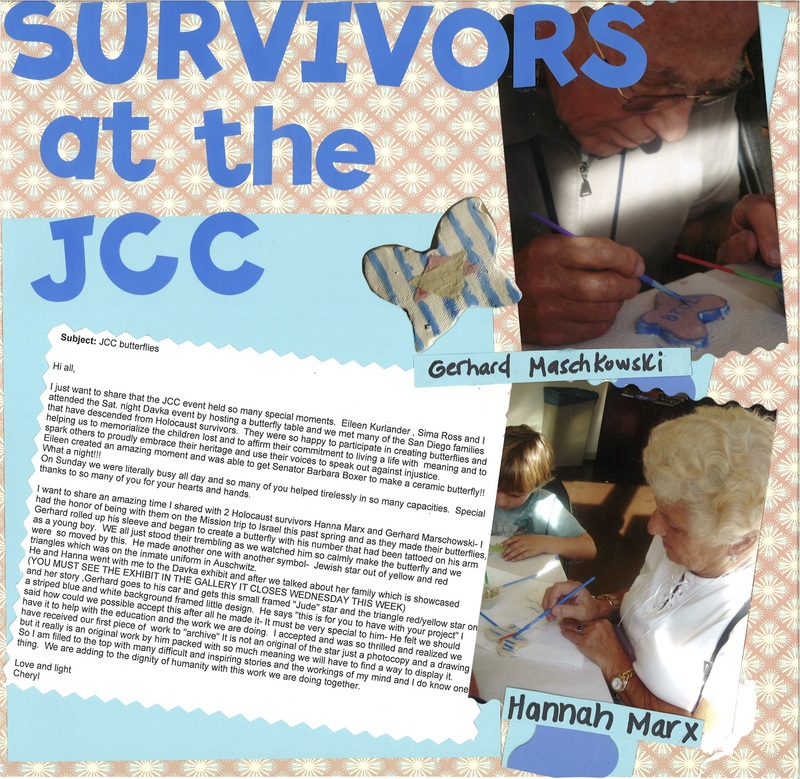 Participants paint ceramic butterflies that are permanently displayed as symbols of resilience and hope, with the goal of creating 1.5 million butterflies around the world—one for each child who perished in the Holocaust, and honoring the survivors. 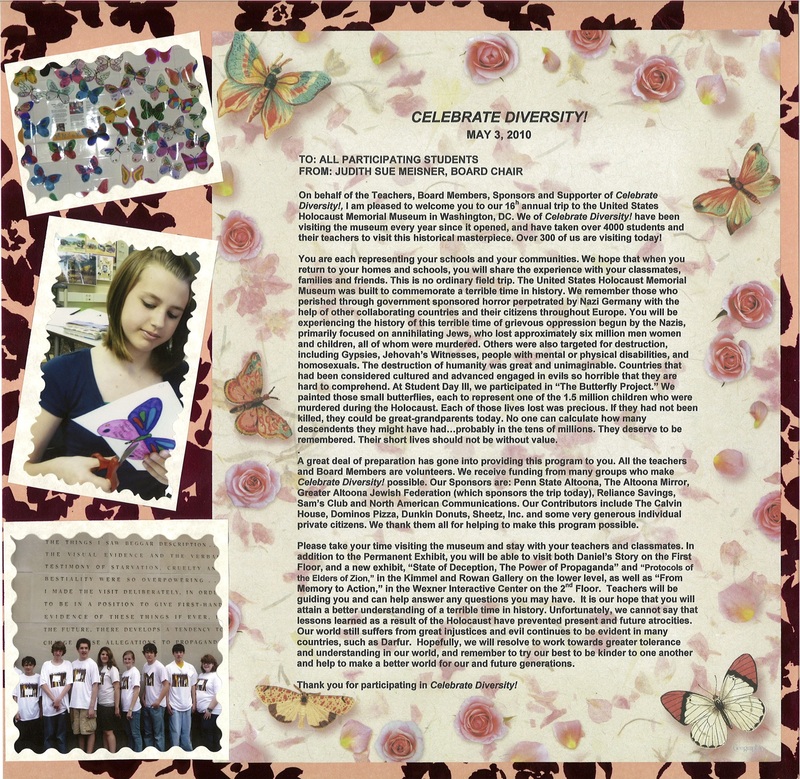 The Butterfly Project will transform resistance through art and education, and empower people to take actions against injustice, partner with everyone that currently has or wants to build a connection to history and honoring those who died in the Holocaust, easily get ceramic butterflies into the hands of people of all faiths through schools, museums, and community centers, leading to bold artistic displays, and be included in classrooms across the country as an important part of Holocaust and anti-bullying education. 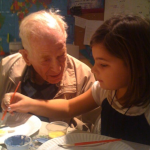 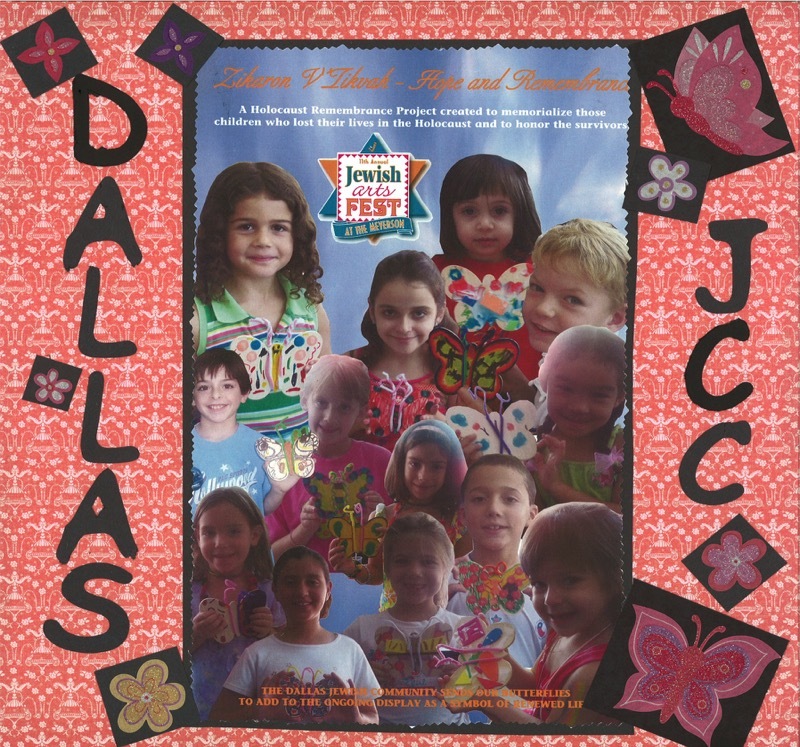 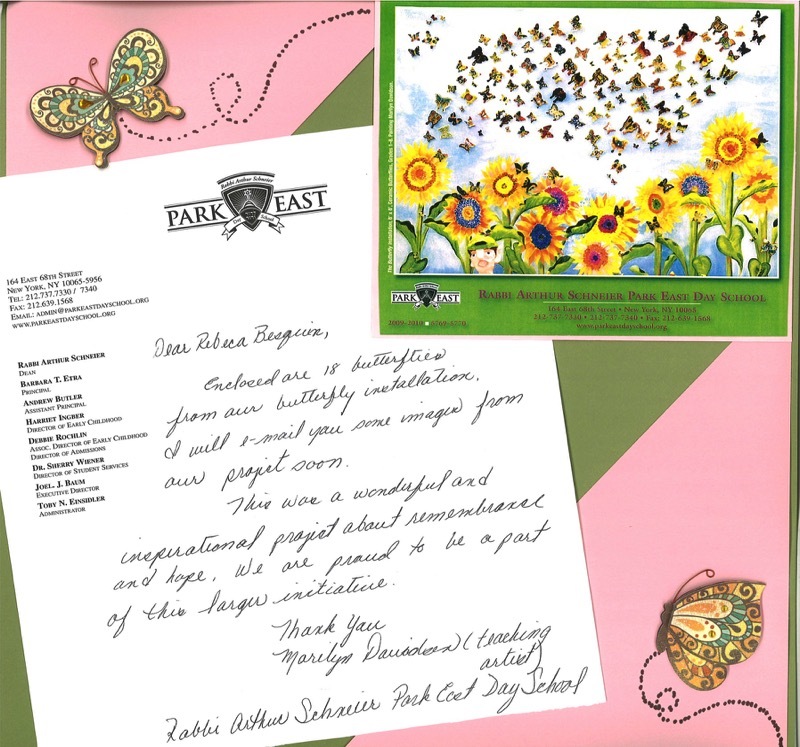 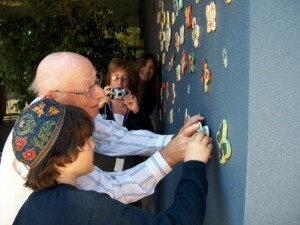 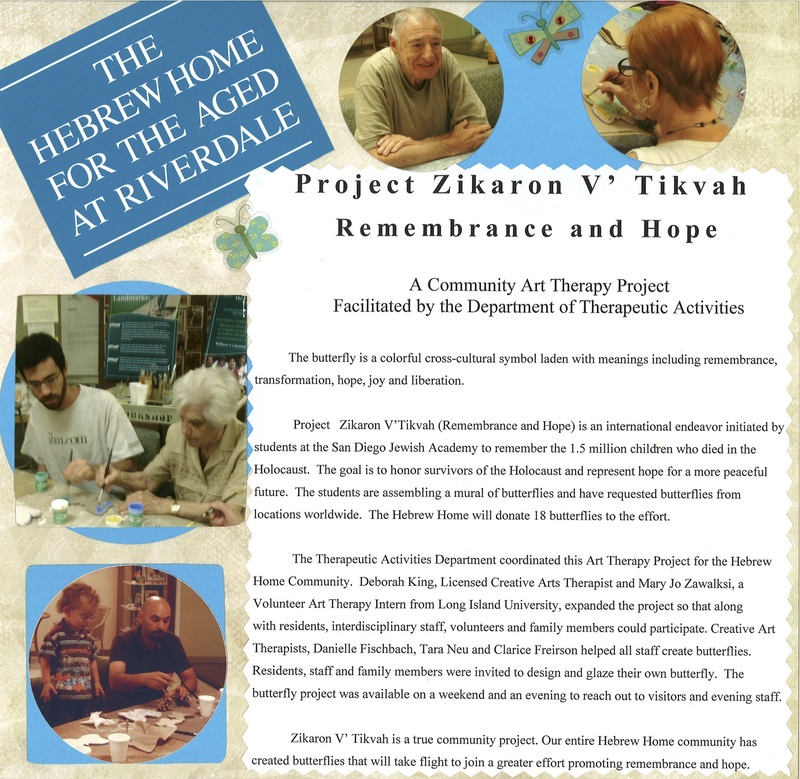 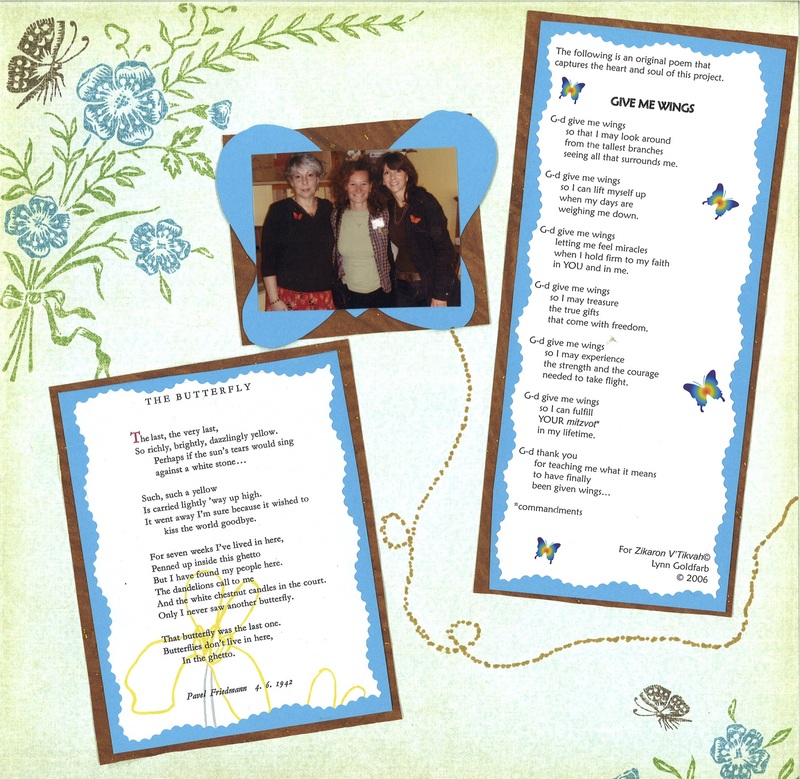 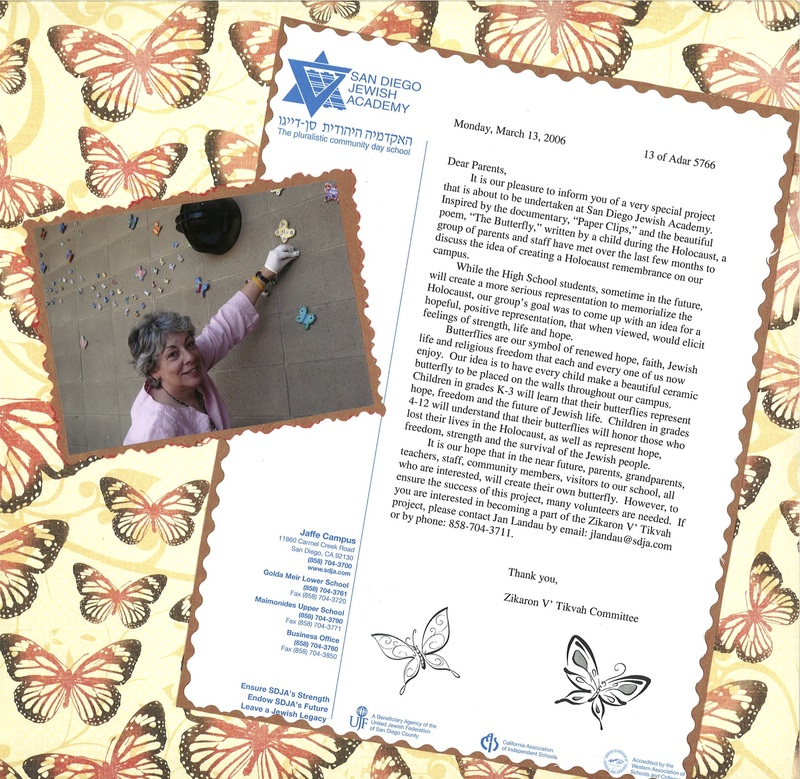 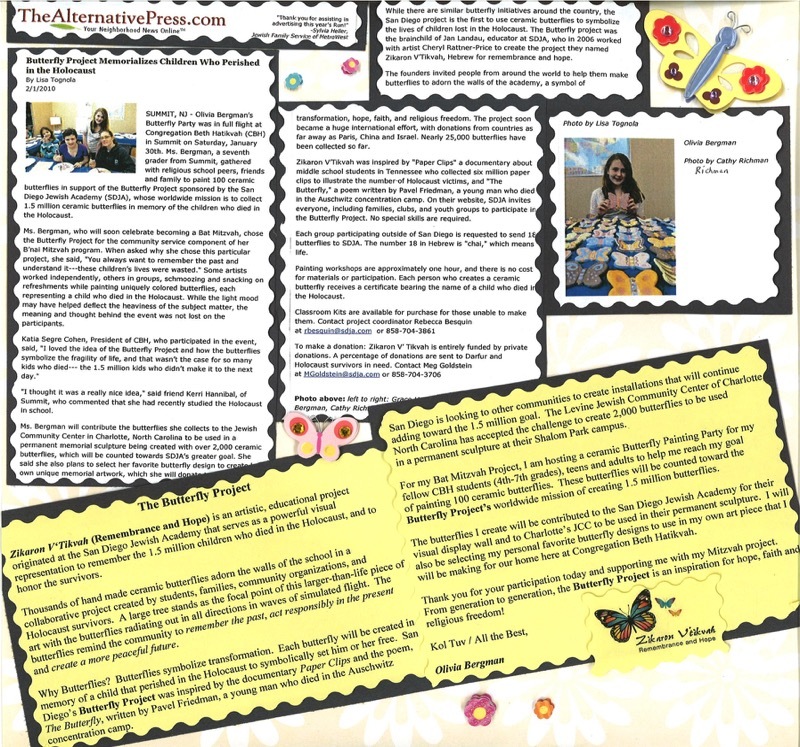 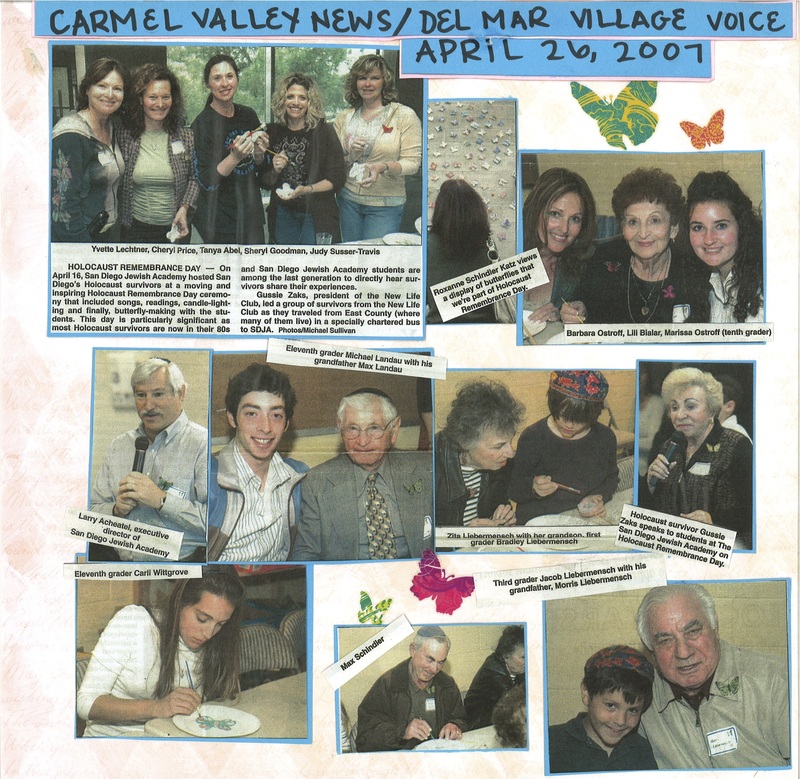 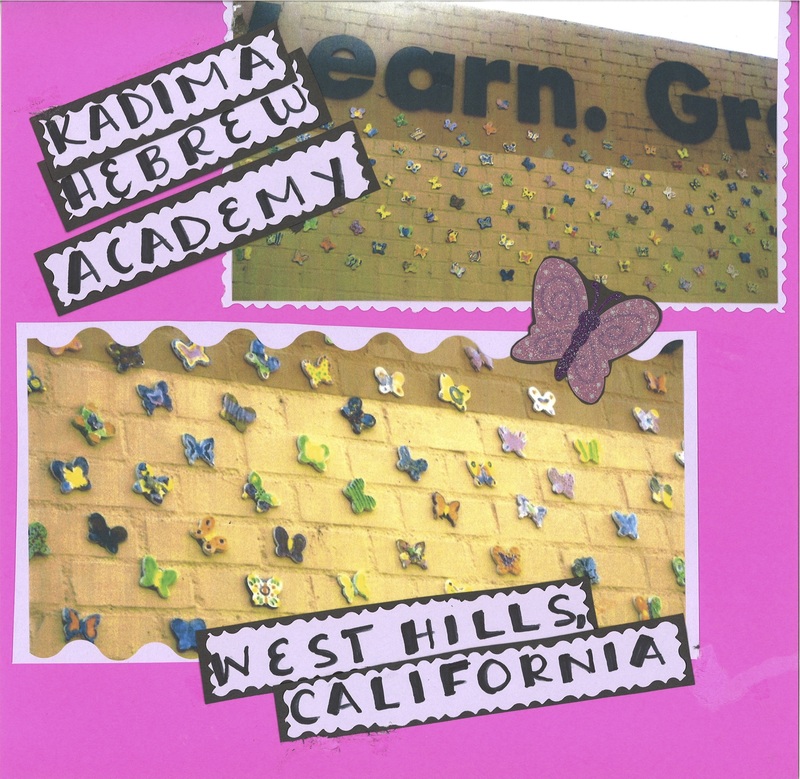 The Butterfly Project (Zikaron V’Tikvah ~ Hebrew for Remembrance and Hope) was co-founded in 2006 by educator Jan Landau and artist Cheryl Rattner Price. 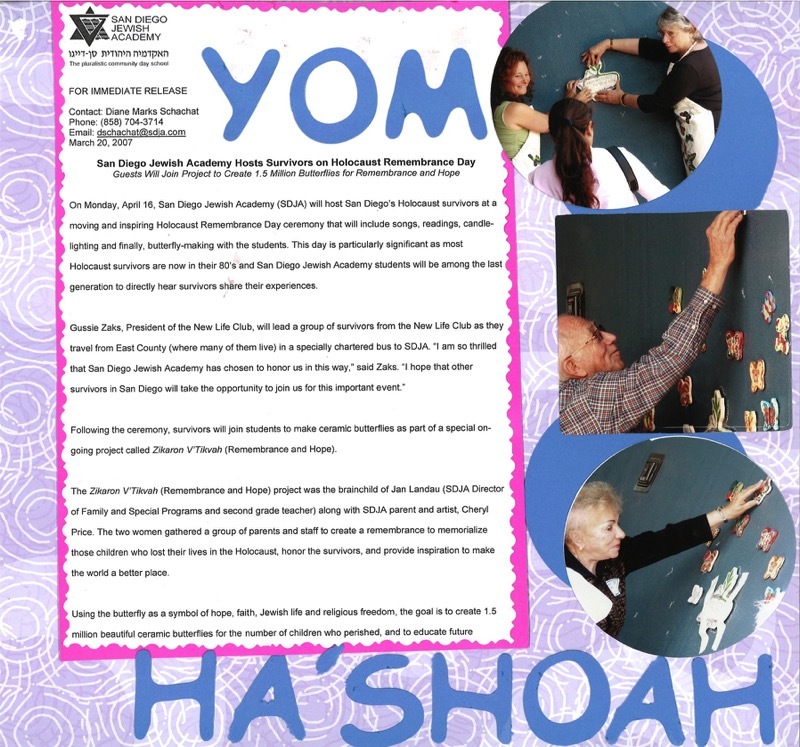 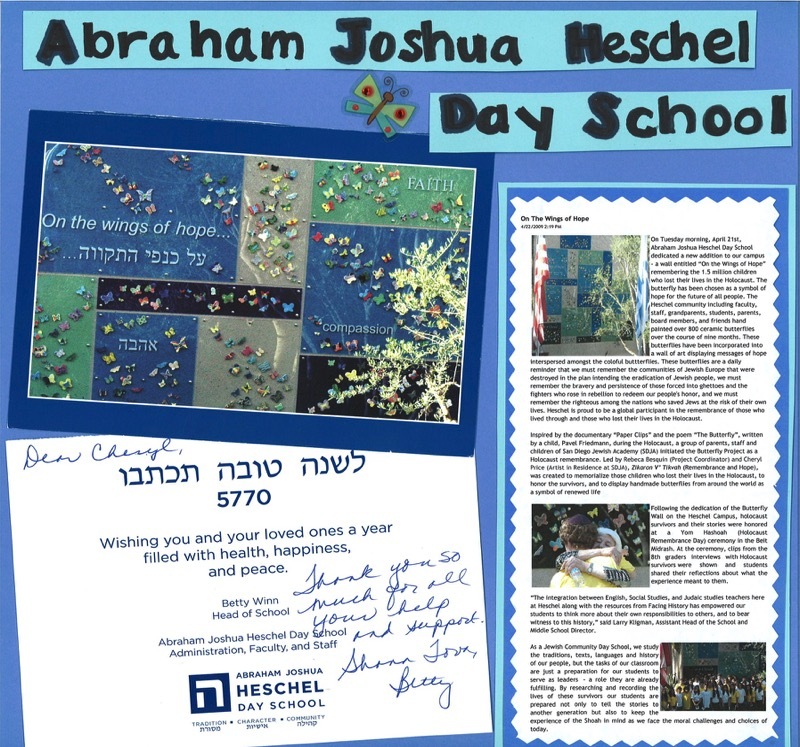 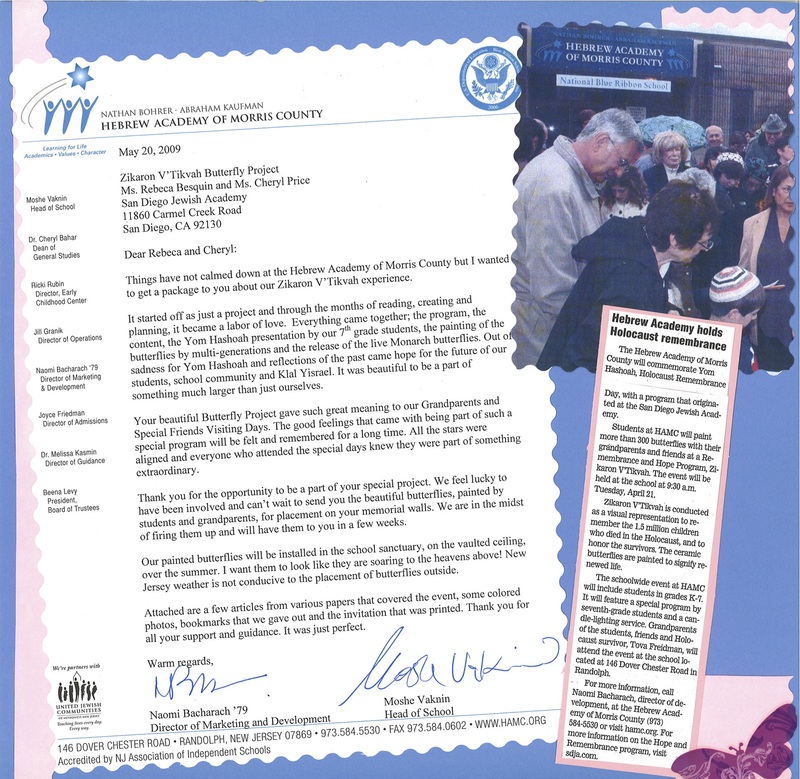 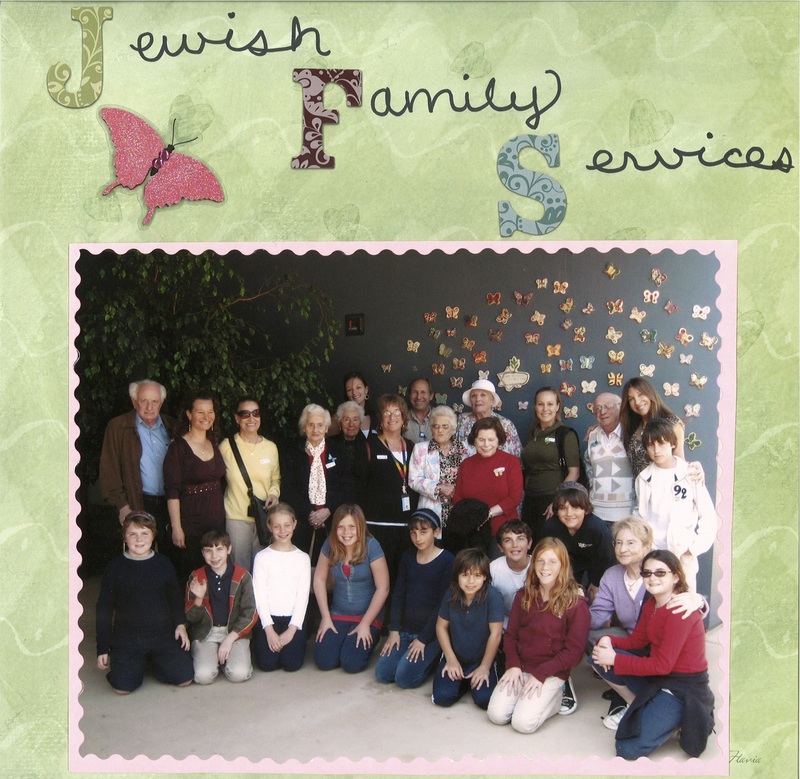 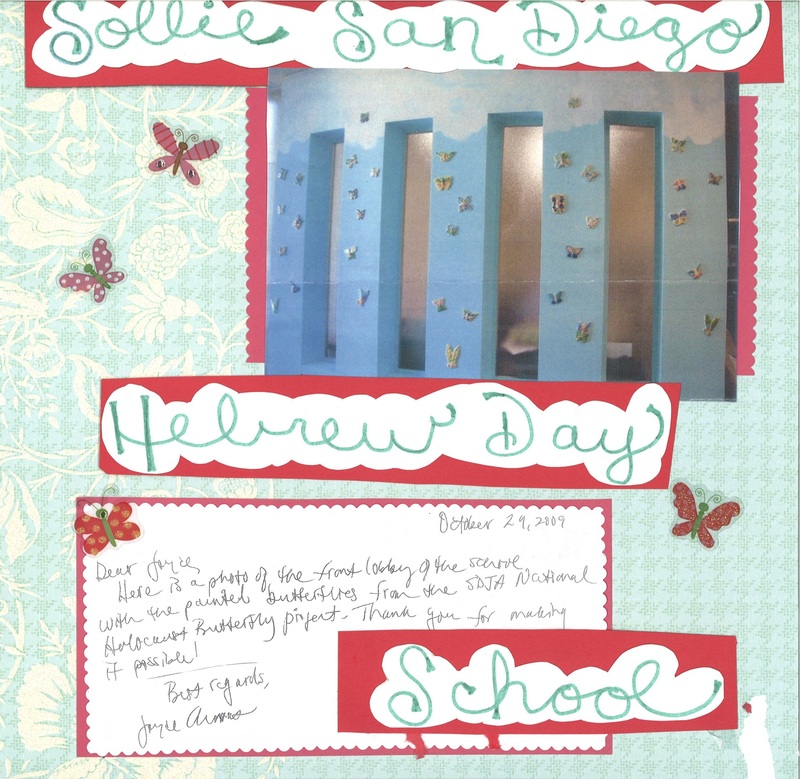 Jan and Cheryl started this as an initiative at San Diego Jewish Academy to take Holocaust education out of the textbook and bring it to life in a way that inspires students to make the world a better place. 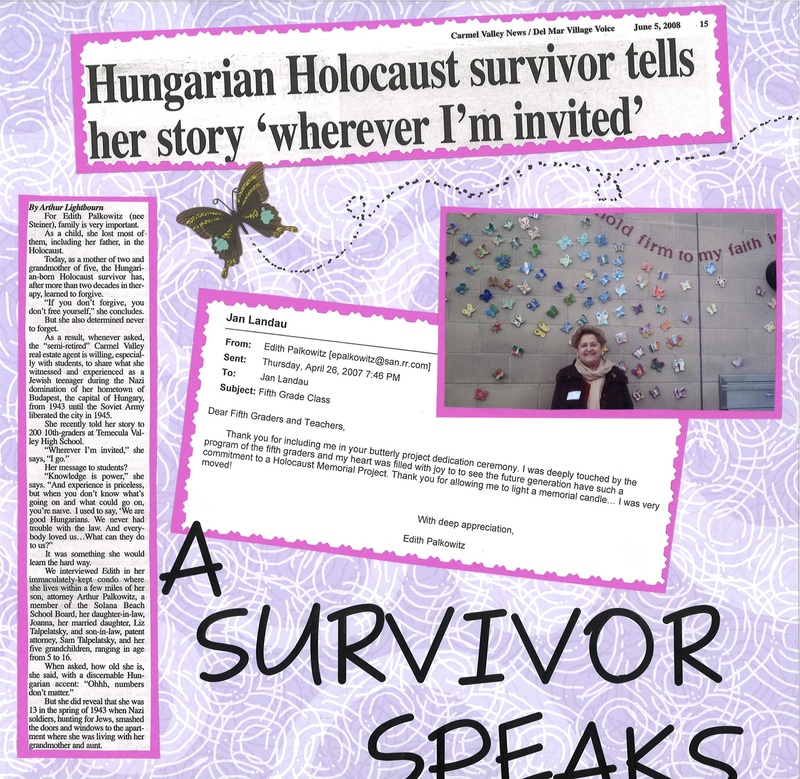 The project draws on inspiration from The Diary of Anne Frank, the poem The Butterfly written during the Holocaust, and the documentary film Paper Clips. 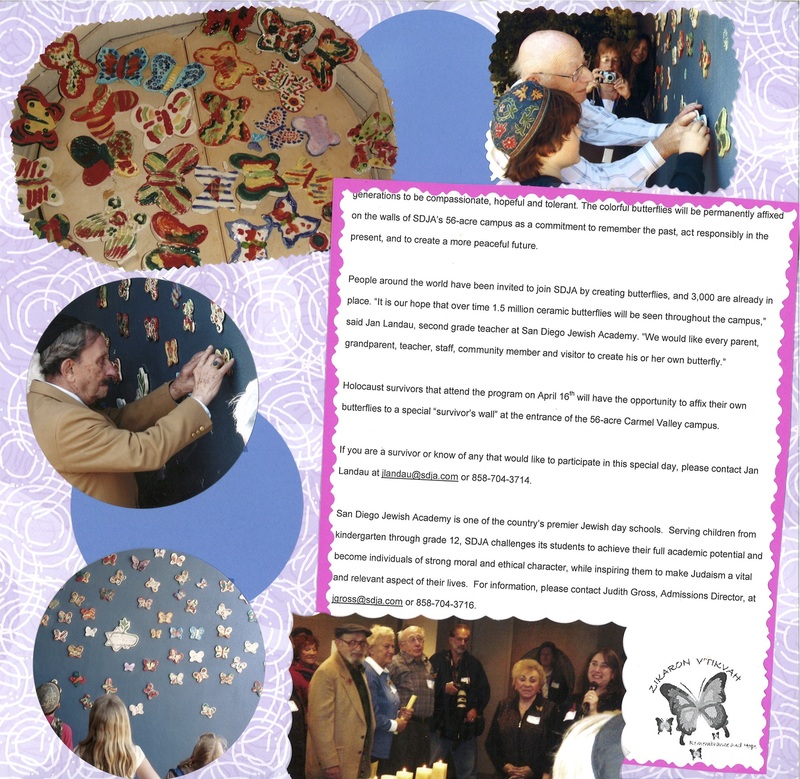 At this time, The Butterfly Project is now a global memorial with over 200 communities counting together, including Canada, Mexico, Israel, Australia, France, Tanzania, Cuba, Morocco and Poland. 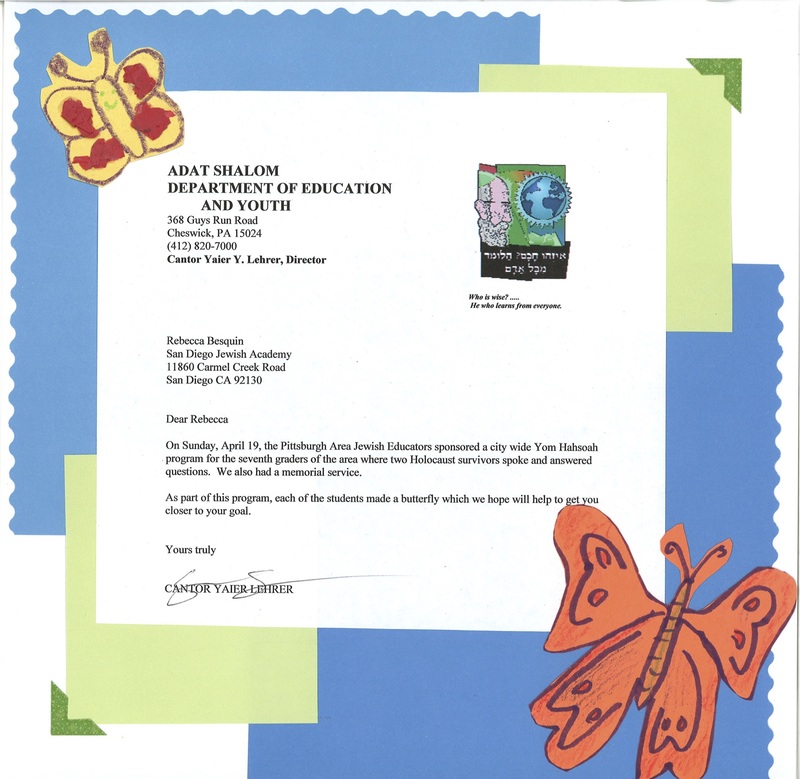 Spend a few minutes looking through some letters and pictures that have been sent to us over the years from The Butterfly Project participants all over the world. 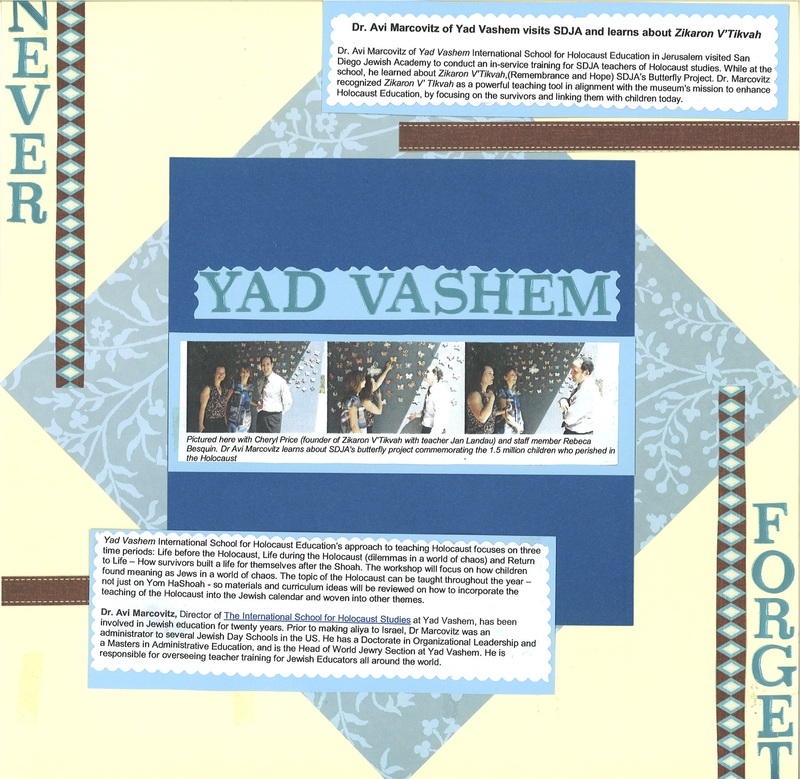 The slideshow will advance automatically, but please feel free to click on the white arrows on the left and right of the image to scroll through manually.